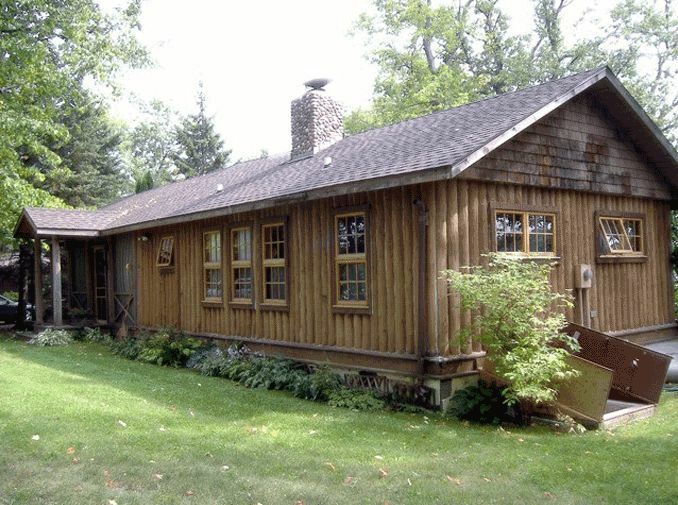 This is a guest log cabin belonging to the Mahoney family. It sits on Big Round Lake, near Hayward, Wisconsin. 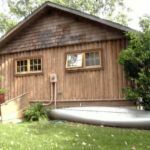 The cabin is constructed using vertical logs as opposed to horizontal ones. 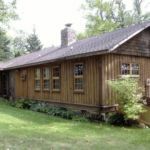 Vertical log homes can present problems that are unique to that particular style of construction. 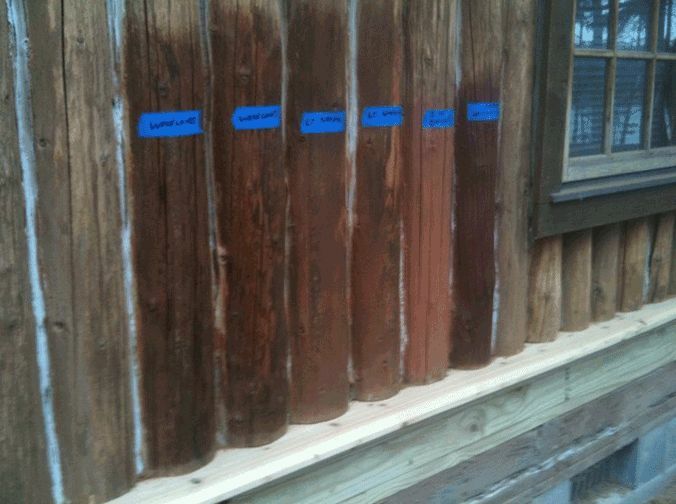 Often, vertical logs rot at the bottom where the log transitions into the foundation. 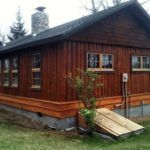 Over the years, Edmunds & Company has fixed this type of problem a number of ways, depending on the log home and the available budget for repairs. Sometimes it makes sense to simply splice a new section of log to the old one to get rid of the rot. This is the simplest and least costly repair for this type of rot. 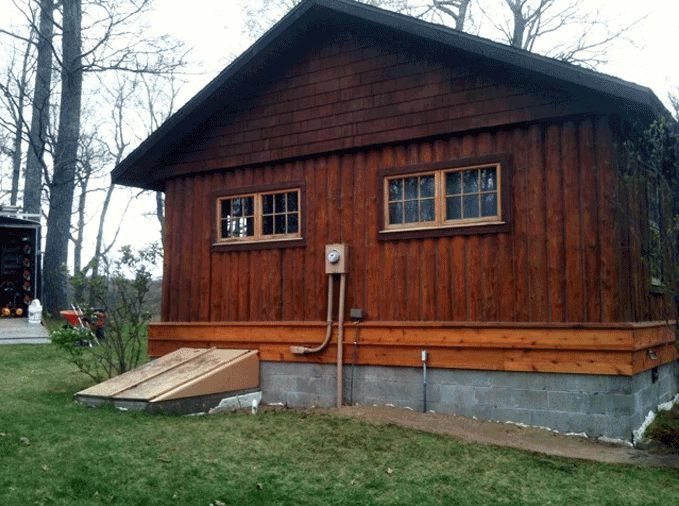 In other situations, what we call the “lumber sill” repair makes more sense. 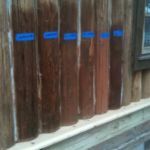 Both are good methods for repairing problems with rot in vertical log homes. 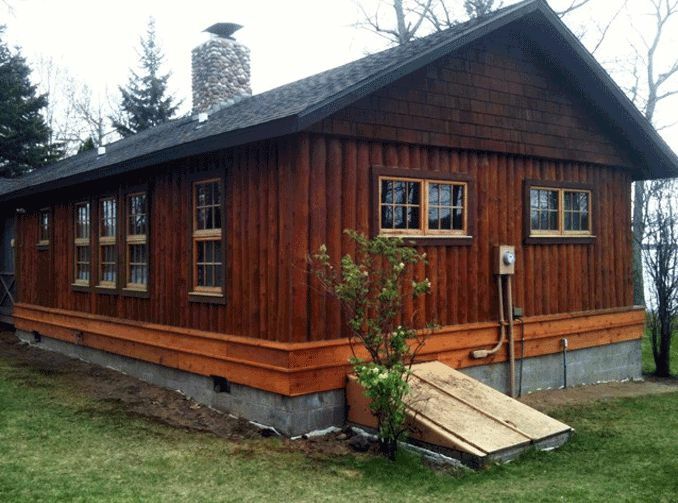 The “lumber sill” technique was used to restore this log home. We had to remove whole sections of this wall. After blasting, different types of stains were tested, including solid-body and semi-transparent. The new ‘lumber sill’ around the place takes shape. The home with is looking great with rotten logs replaced, lumber sill installed, logs stained, and new chinking installed. 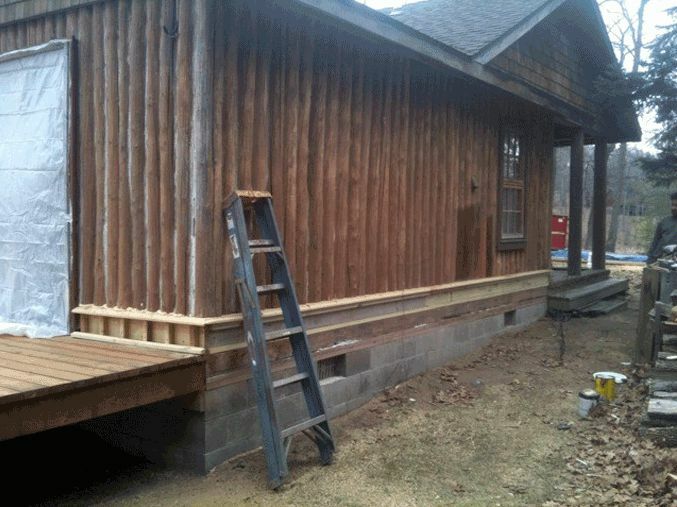 This vertical log cabin had rotted logs and the finish needed updating. The mortar chinking was not keeping the logs dry. 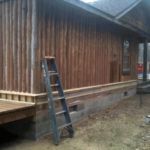 To create the lumber sill, the outer half of the bottom 12” or so of each log was removed using chainsaws and air tools. The log wall was supported where necessary. 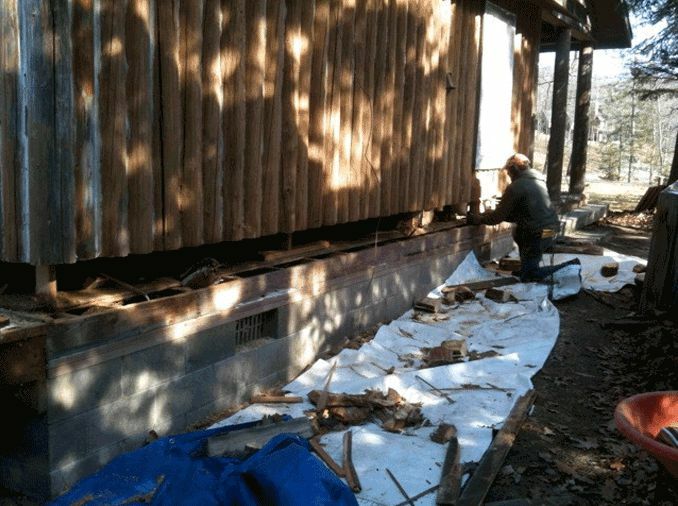 Next, a framed sill made with lumber was built to further support what was left on the bottom of the vertical logs. The sill is finally trimmed out with cedar lumber and sealed up with chinking to keep water from making its way into the cut off ends of the logs. 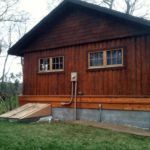 Edmunds & Company has used this technique on a number of buildings over the last six years and we have found it to be the best, long-term solution to the rotting issue with vertical log homes. 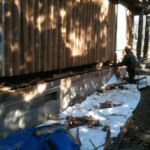 Another technique is to replace the entire log from the foundation to the roofline. These photos show this more extensive type of repair on a project we did near Hayward, Wisconsin. Click here to see more. 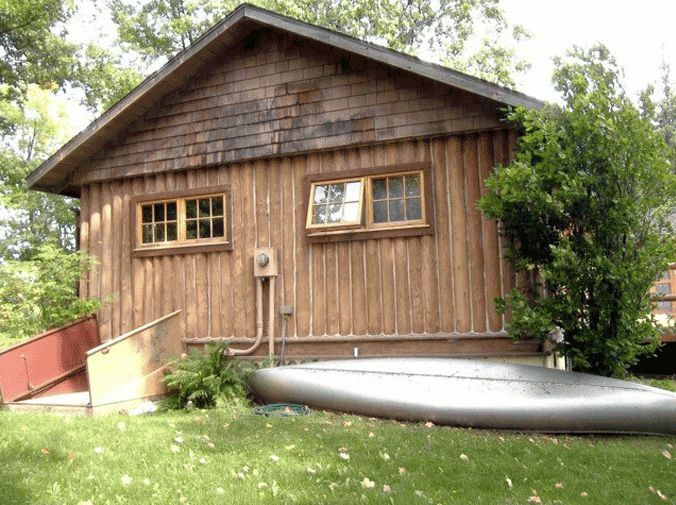 Not sure what the best approach is for your log home? Consult with Edmunds & Company and let us help you come up with what’s right for your home.